Your last note, crust, is rather interesting. That Black plays first may be a little confusing for players who have come to the game right off chess, but that brings up an intriguing point. For all that we complain about our lack of knowledge of Tafl from the Old Norse Sagas, we have ignored one important note. Both the Friðþjófs Saga (though it more implies it) and the Hervarar Saga (better known to some perhaps as the Saga of King Heidrek), in the Heithreksgátur (riddles of Heithrek), agree that the Attackers are coloured White and the Defenders Black (or red). It is strange that we have ignored this despite the fact that we yearn for more from these sagas. This practice would also have it so that White DOES move first (just a bit easier), and would be more historically correct. For the moment our current practice is fine, but maybe it would be better to normalize our notation so that the Attackers are White and the Defenders Black in time, especially if we form an official association. Also, when we notate Hnefatafl perhaps it would be profitable to standardize notations for the quadrants of the board, for easier reference, especially in theory if we talk of which corner the Defenders (who I will still call White) are attacking, although the board is symmetrical (and so are the openings, but it is specifically useful in middlegame references). And on this, perhaps it would also be best to standardize (again in the future) where players sit in live tournaments. I know this seems rather small, but it is easier for seeing which corner is being attacked, so that we say that the 'Attacker' player is sitting in front of the 1st Rank while the 'Defender' player is sitting in front of the 11th Rank. I will be referring to the two sides as “white” and “black” even though this convention is not universal, and you may find a hnefatafl set which reverses these colours. Some people prefer to call the two sides “attackers” (round the edge) and “defenders” (in the centre) but this can be ambiguous, as the roles of attacker and defender shift and change during the game, after all, as you will see, the attackers have to defend the corners, whereas the defenders frequently attack the attackers. In fact, it is more common for black (attackers) to play defensively, and white (defenders) to play aggressively. On the whole, it is easier to call the player who has 12 warriors and a King and starts in the centre of the board “white”, whereas the player who has 24 warriors and no king, and starts at the edge of the board is called “black”. So I am going along with the convention observed by most game manufacturers and websites. As for which is more historically correct, I'm sure you're right about that! Though of course that, too could have been a local convention and not universal. Another issue that might need standardising, is that Dragonheelslair omits the letter "i" so the files go from "a" to "l", whereas aagenielsen doesn't, and they go from "a" to "k". I might take this up with Dragonheels, as I don't really see a problem with the letter "i". However, I presume he has followed the same policy in all board games with 9 or more squares, so he may not like to change. Evans wrote: perhaps it would also be best to standardize (again in the future) where players sit in live tournaments. .... not sure I quite understand your point here. Surely it doesn't matter where the players sit, as long as they agree on the notation of the moves? Sorry if I'm being dense! My own hnefatafl board has co-ordinates because I used to play Adam over the phone (before we started playing here on aagenielsen), and sometimes at the end we would discuss aspects of the game and realise that one (or both) of us had the board the wrong way round, but it didn't affect the game at all, just meant that we couldn't use terms like "bottom left" or "top right". So we just said "the a-11 corner" or "the k-1 corner". Peter Kelly says on http://www.fetlar.org/hnefatafl-world-championship : Unlike chess the pieces oppose each other from the centre and the sides. 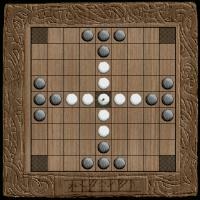 This means that Hnefatafl players need not sit opposite each other while playing. Though of course, they DID sit opposite each other at the championships, because it would be ridiculous not to. But the boards there had no co-ordinates anyway, and the games of course were not notated. conanlibrarian wrote: Has anyone got a clue where the colors come from? On the board the word "hnftafl" is carved in runes. I think the game was used for museums and history exhibitions in Sweden, and it was also on the internet for many years until about 2002. In those days every Hnefatafl page with respect for itself around the world linked to the Expo Media game. I think the game was used for museums and history exhibitions in Sweden, and it was also on the internet for many years until about 2002. Dozens of Hnefatafl pages around the world linked to this Expo Media game. I also checked Bell (Board and Table Games from Many Civilizations, 1979) and it talks about "eight blonde Swedes and their monarch; the other has sixteen dark Muscovites." (p. 78), and it uses black and white circles in the examples, for Muscovites and Swedes, respectively. It would be interesting to see if this was introduced here, or by Murray. conanlibrarian wrote: I also checked Bell (Board and Table Games from Many Civilizations, 1979) and it talks about "eight blonde Swedes and their monarch; the other has sixteen dark Muscovites." (p. 78), and it uses black and white circles in the examples, for Muscovites and Swedes, respectively. It would be interesting to see if this was introduced here, or by Murray. I'm late to the party again. Murray in 1952 shows a simple board layout diagram with white Swedes and black Muscovites, but in the text describes the pieces as distinguished by shape rather than colour. In his 1913 History of Chess only the empty board is shown, with patterns on starting squares, and no mention is made of the shape or colour of the pieces. F. R. Lewis uses black attackers and white defenders in his 1941 article Gwerin ffristial a thawlbwrdd. But I don't think one should read anything into the diagrams, as Bell apparently did. It's natural in such diagrams to use black and white, so anyone creating a diagram has a 50% chance of one combination or the other.